Here is a new "FPIP chart" for SpaceX. This time, as we are well into 4th quarter, I shifted the window to include the 1Q 2018. So, there are many new points on the chart and a lot of guesswork. Therefore, I'd be grateful for any corrections/suggestions before I put the chart on the first page of this thread. Once again, the purpose of this chart is not an attempt to predict, but to visualize the launch cadence in near future and possible schedule conflicts. We do know that SpaceX CAN do launches only 10-12 days apart on LC-39A. What do you think about Vandenberg's SLC-4E? It still has old style TEL (open type) - may this slow down the operation? Is there any general clues on *specialization* of the Cape pads? All I know is that LC-39A will be used for all FH launches and all CCT-related launches. Any other clues would be helpful for the chart. For example - if military launches will prefer SLC-40? Also - will NASA prefer to use LC-39A for CRS flights? ORS-6 should be changed to SSO-A (I think that will launch a couple months later but not sure yet.) SAOCOM-1A has slipped to June. The Vandenberg schedule is going to be interesting in the first half of 2018 but I doubt they need to do rapid turnarounds. I'd be surprised if they try a pace faster than 3 launches in two months at any point on the west coast next year. It's highly unlikely that all of the flights we currently have listed for the first half of 2018 actually get launched in the first half of 2018. At the Cape I would still put TESS in March. SpaceX will still be constrained by launch vehicle availablility for much (all?) of 2018 so expect slips to the right on a lot of the flights. - As late as this July the decision of whether to build AMOS-8 inside house by IAI or to order it aboard has yet to be decided! And the other thing of note, the Amos-17 launch is free to make up for the Amos-6 failure. 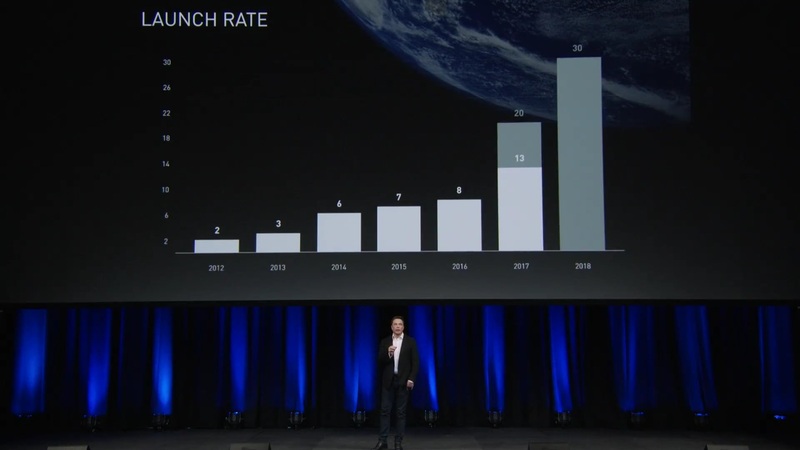 With 2018 already full beyond the 30 missions Elon suggested at IAC, the 2019 manifest starts to fill up. I'm not sure 2018 is beyond 30 missions yet, I think I'm going to remove the Spaceflight Industries entries after SSO-A until we hear whether/when those are actually booked. When the GPS satellite will launch is also kinda uncertain right now. They got the AMOS-6 launch for $50 mln. Spacecom was an early customer for SpaceX with Amos-6, and paid about $50 million for the launch. If the Google translation is correct, Amos 17 will launcher free under the contract for the lost Amos 6 satellite, with a reused 1st stage. The Spacecom press release (in Hebrew) is attached for anyone who can read it. It's also possible that SpaceX's last mission of the year, the Spanish communications satellite Hispasat, could fly on the inaugural launch of the Falcon Heavy rocket. Popular Mechanics is not a credible source for our manifest information. The consideration paid under the Amos 6 satellite launch agreement prior to the amendment will be recorded In full for a Amos 17 launch and no additional charge will be required for the Amos 17 launch. 1.3 Conditions have been agreed with regard to scheduling the launch and priorities in various cases. They were also arranged Conditions enabling the launch of the satellite using a Falcon 9 launcher that includes the first stage flown Previously. Google translate, like Jim, is usually right.